The hot Cajun spices contrast well with a small amount of sweetness from dark sugar in this healthy salmon recipe. Combined with quinoa, watercress and sweetcorn, it's a delicious and satisfying meal. Mix the marinade ingredients together in a bowl. Add the salmon fillets and leave to marinate for 20 minutes. 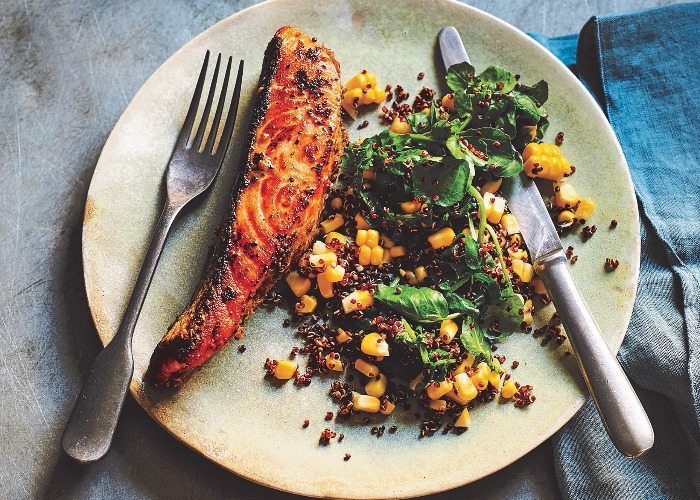 While the salmon is marinating, soak the quinoa in a bowl of water for the same amount of time. Add the quinoa to a dry saucepan over a medium heat and toast the grains for a few minutes. Boil the 500ml (17.5floz) water then add it to the pan of quinoa along with the paprika, sweetcorn and some salt and pepper. Simmer for 15 minutes then plate up with the watercress. Heat a frying pan over a medium–low heat and place the marinated salmon fillets in the pan, skin side down. Press them gently for the first 30 seconds. Cook for about 6 minutes until the top side begins to turn opaque, then flip the fillets over and cook on the other side for a further 3–4 minutes until cooked through. Place the salmon on top of the quinoa and watercress and enjoy. This recipe is from Eat to Beat Illness by Dr Rupy Aujla. Published by Harper Thorsons, £16.99.